Anyone who knows anything about me would not believe my first post on this new blog would be about the Korean beauty (KB) product craze. But the phenomenon is real. And it’s quickly becoming a mental disorder. 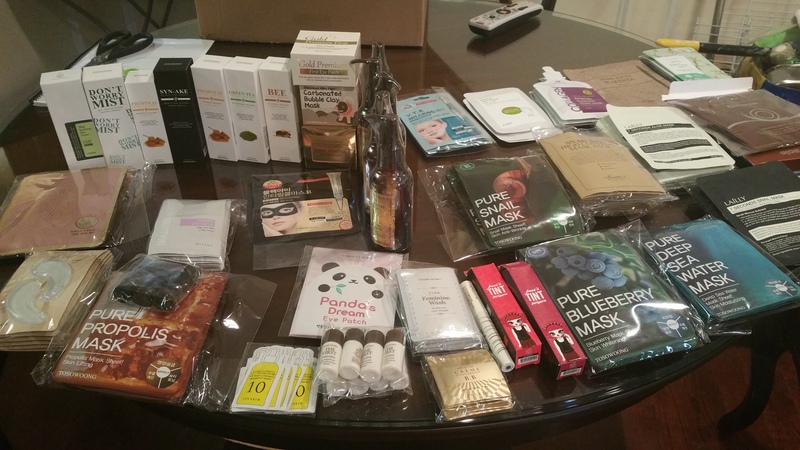 A very dear friend introduced me to the joys of Korean beauty products and I must admit I’m hooked. After only three days, the changes in my skin were startling. By week three, I’d gone gone from a mild mannered (at least about beauty products) cynic to vigorously exercising PayPal buttons on sites worldwide. Okay, this wasn’t JUST my order–I did split it with a friend. One friend. All of this does beg the question: why the fuss? Why is this KB product “haul” phenomenon growing apace? Bottom line: the products can be as inexpensive as they are effective. High-quality ingredients at rock bottom prices by Western standards. And. They. Work. What’s not to love? To put things in proper order, you first have to understand that unless you are using products that keep your skin within the normal pH range, your face will not properly absorb the yummy products you’re using. More about pH and why that’s important in a minute. There are great blogs on KB/AB all over the web. Asian Beauty over at Reddit (check out the list of topics, sub-blogs and shopping sites galore on the right-hand side) is a mother ship. Snow White and the Asian Pear and Fifty Shades of Snail will get you off to a great start as they are oft quoted bloggers across the web. These latter two KB bloggers extraordinaire are meticulous about their obsessions. They have DOWNLOADABLE SPREADSHEETS for keeping track of everything from routines, product testing and inventory rotation (when ordering internationally for best prices, it can take awhile to get to the U.S. unless you pay the highest shipping rates–a girl has to plan ahead!) to itemizing your ever-expanding inventory of sheet masks by brand noting type and ingredients. There are product ingredient masterlists with U.S. vs Korean ingredient listing order differences explained and even easy, how-to guides and translations for shopping on sites in Korean! There is even a currency converter at the bottom of the aforementioned translation shopping page in a downloadable spreadsheet. It’s CRAZY. So if you’re up for finding some clarity in the maze, I’ll occasionally blog about my experiences (and if I can talk my friend into it, she will as well!). In laying the groundwork, my skin is normal to dry and, as I’ve found out on this trek, with a tendency toward becoming dehydrated. You can seek answers about finding your skin type all over the web but I would pay special attention to that dehydration link if that’s something new to you. It can be part of your problem whether it is acne, aging, fine lines and wrinkles, irritation, breakouts or whatever your affliction. Do your homework. I’ll also state here that I am not a doctor nor am I any sort of medical professional. I have no professional training in the medical field. Nothing here is intended to be medical advice. If you have serious problems with your skin, see a doctor. Let’s start with a simple introduction and we’ll ease into what’s next. As I mentioned earlier, no matter how good any product may be, if your face won’t absorb it, you’re wasting your money and your time. And your face is the worse for wear. You have to start with pH and finding out the levels of the products you’re currently using. The biggest offender in upsetting the pH on your face is likely to be your foaming cleanser–that soapy liquid you lather up with water to wash makeup and the day’s grime off your face (oils are much more effective for busting up what’s on your face but we’ll get there). The easiest way to tell is to go on Amazon and buy pH testing strips. They’re inexpensive and will let you know the pH level of anything you’re using on your skin. There is, of course, a working spreadsheet at Reddit Asian Beauty (/r/AsianBeauty) on pH levels of cleansers that you can search for your brand. Mine wasn’t there (and a quick Google search didn’t find it), so I bought the test strips to have on hand to be able to test now and in the future–which was the smarter move. The epidermis, which is the visible part of our skin, is comprised of multiple layers, with the outermost layer being the stratum corneum. The stratum corneum is the protective layer, and what we also know as the ‘moisture barrier’ or ‘lipid barrier.’ It’s comprised of dead, flattened cells called keratinocytes, which are continuously shed and replaced by newer keratinocytes, and held together by fatty acids, ceramides, and other lipids. Together, the lipids and keratinocytes act as a waterproof barrier that effectively keeps water in the skin and prevents bacteria, irritants, allergens, and other microorganisms from permeating it. The lipids also play a key role in encouraging new cell proliferation in the deeper layers of the epidermis. What is pH, I need a refresher? The pH of your skin, and does it matter? The pH of your cleanser, and does it matter? The claim that alkaline pH = efficacy, is it true? An extraordinary post on what pH is, what it does and how you can REALLY mess up your face without really trying. Finding the perfect Asian Beauty routine is all about repairing then keeping that barrier and your acid mantle happy and coaxing it into absorbing the nutrients you’re importing from South Korea. So get those pH strips, figure out what you’re doing to your skin now, and here’s your homework assignment for the next time from Fifty Shades of Snail: How to build your own Asian skincare routine and from Snow White and the Asian Pear: Putting your products in order.